Holocaust Survivors: Photo Gallery - "Auschwitz Record of Transfer to Gross-Rosen"
This is an original document from the archives of the National Museum of Auschwitz-Birkenau which lists the name of prisoner Solomon Radasky (Slama Radosinski) Auschwitz No. 128232. It is dated January 28, 1945 and concerns the transfer of prisoners from Auschwitz to Gross-Rosen concentration camp. Each prisoner is listed with a Dachau number and a Auschwitz number. 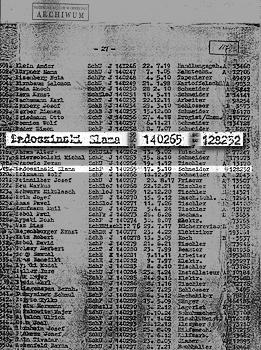 Mr. Radasky is listed as captured Polish Jew (SchP J) and given Dachau number 140265. His date of birth is May 17, 1910 and his profession is Schneider (Tailor). Page 1 of this document is available in the Photo Gallery. Of interest, 3 entries above the Radasky entry there is a listing on this same page for an Alter Abram captured Jew from the United States of America (SchUSA J), Dachau number 140262, Auschwitz number 77247, date of birth March (or May?) 13, 1902.